The top two reasons parents choose New Hope, "traditional" philosophy of education, and outstanding achievement test scores. New Hope Christian School implements a "traditional" philosophy of education, which differs greatly from the public schools philosophy of "progressive" education. Group projects, redirection tactics and child-led readiness are all tenets of progressive education that are not employed at New Hope. Rather, NHCS follows a more traditional curriculum; we teach love and obedience to God, accountability for individual actions, behavior and efforts, which are all important in creating healthy, responsible adults. NHCS teaches absolute truth and our children learn that their responsibility as an individual matters. New Hope students consistently perform at the top of regional and national rankings, out performing the majority of their peers. 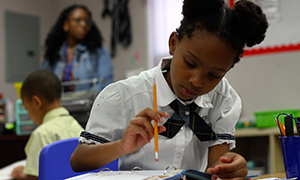 Each student's National Percentile Rank score is calculated by comparing test performance against others within the same age range and grade level. The average rank in the U.S. is 50th percentile; New Hope students have ranked in the 90th percentile for both reading and math since 2014. Students at New Hope are consistently scoring better than 90% of their peers in core academic areas!